Share what you thought about Empathy for a Killer and earn reward points. 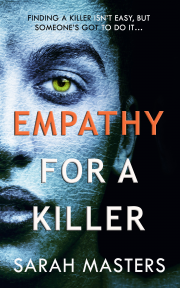 I admit I was a bit hesitant when I first started reading Empathy for a Killer but as I got further into the story the emotional torment of the two MC’s for two very different reasons made me change my mind! For me the MC’s in this book are not the lovers, they are the detective and the murderer they are so alike yet at the same time so very different, for obvious reasons. Oh my goodness guys! This was an incredible book! I love cop novels, especially ones with a well written mystery and some pretty gruesome murders. Empathy for a Killer fits this description to a T. Add a hardheaded hero trying his best to not be in love with the man who loves him back, and you have, in my opinion, the perfect book. Once I started reading, I couldn’t put it down. I didn’t want to leave Burgess and Shaw, even if it meant I only got two hours of sleep. So worth the exhaustion!... Sarah Masters nailed the perfect balance of passion and pure love... The story was compelling, and it was fascinating to read what made this murderer become the monster he was... The ending was completely satisfying, and when the story was over, I actually applauded (even though I wasn’t thrilled with having to leave Burgess and Shaw). Empathy for a Killer was a pleasure to read. If you enjoy a good murder mystery with flawed but loving main characters full of passion for their jobs and each other, this is definitely for you. I’d give it a hundred stars if I could. I was enthralled by the story, and as it became more complex I had a hard time putting it down so I could attempt to do real life things. Well done, Ms. Masters. This was a twisted, totally engrossing story. You watch the killer go through different phases, flashbacks, and come to the realization of who he is. Throughout his journey, you see how difficult his life had been... Masters wrote a well-developed murder – who done it story... very entertaining. Wow, this book really took me on a wild and crazy ride. This book is a full on psychological thriller with a teensy tiny dash of romance... [It] kept me very much glued to the page and more emotionally involved than I ever expected to be. Funny and sweet with lots of honest pain and fear, for everyone involved. Worth the read.